In a recent interview which was a part of the 60 Minutes segment on Apple, Apple CEO Tim Cook detailed the qualities Apple needs in a candidate. These qualities include a desire to do things differently, a different way of looking at things, and a lot more. Read the article and know everything Apple CEO had to say. How to get a job at Apple? What qualities does the world’s most valuable brand look for while going through your resume? In the recent 60 Minutes segment focused on Apple, Apple CEO Tim Cook revealed more about Apple’s hiring process. Talking to veteran journalist Charlie Rose, Cook said that Apple looks forpeople who work for a different reason and are willing to change the world by working with passion and idealism. Calling the hiring process of Apple tough, Cook said that Apple needs the candidates who don’t take a no for an answer. “People that don’t take no for an answer. People who don’t accept the status quo,” he said. Sounds like Steve Jobs, right? To be a part of Apple, you must be unsatisfied and know how to look at things differently. “People that can’t be told things are impossible. They can’t accept that,” Cook said. Apple’s hiring process is very rigorous. To become an Apple employee, one needs to face 10-12 people who interview a candidate to study him/her from different point of views. Cook says that there are tons of people in Apple who don’t agree with him and present a strong opinion to defend their point of view. According to Apple CEO, this quality inspired them to make things better. “We’re looking for wicked smart people who have a point of view, and want to debate that point of view, and people that want to change something. People that want to make things better,” Cook said. Tim Cook’s definition of a perfect candidate sounds just like Steve Jobs. Over the years, Apple has refined its work culture and hiring process, but some things haven’t changed much. Add your views on Tim Cook’s interview in the comments below. For those who have a non-touchscreen laptop, a new device called AirBar has come into existence. Created by a Swedish company Neonode Inc., the device is capable enough to transform any ordinary laptop into a full-fledged touchscreen device. Neonode Inc. will demonstrate their creation at CES 2016. Touchscreens have been prevalent in the digital market since almost a decade and they contribute towards a stupendous device experience. Almost every interactive device now boasts a touchscreen display so it can express its superiority against its outmoded counterparts. But now, these non-touchscreen devices can perceive solace about their existence, thanks to an awe-inspiring gadget developed by Neonode Inc., which has its expertise in Optical Interaction Sensing Technology. They call it AirBar and it is a simple plug-n-play device, which is like the fairy godmother for the laptops whose masters weren’t tender-hearted enough to favour them with a touch functionality in the age where most of the modern laptops do feature a touchscreen. 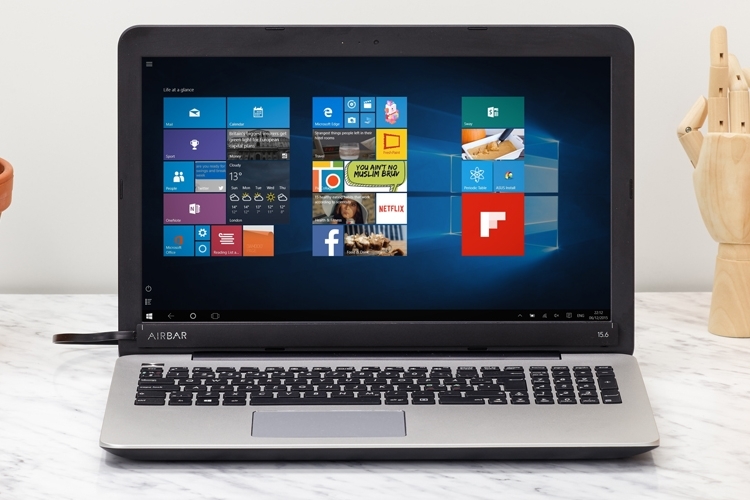 The sensor uses zForce Air™ technology developed and patented by Neonode Inc. and finds its place on the bottom bezel of your laptop by magnetically attaching itself. It then emits some invisible light waves over your laptop screen which help AirBar sense any sort of interaction between the user and the laptop screen. Basically, you are interfering the field of light waves emitted by AirBar, helping it to sense the point where you touched the screen. The signals are then translated into a pertinent format which can be easily understood by your innocent laptop feeling proud that it can now compete with its rivals and provide you a better experience. Once your laptop has transformed into a fully functional touchscreen, you can feel free to touch it with your bare hands or if you want to use a paintbrush or you have long nails, go for it without a second thought. It’ll surely work. AirBar will wholeheartedly assist your laptop to efficiently construe all the gestures like pinch-to-zoom, swipe, and scroll. Imagine taking a non-touch PC, and within seconds making it a touch interactive device. Our sensor does not require installation of new drivers or lengthy instructions. The user simply connects AirBar and can then start to interact with the display immediately – it´s Plug and Touch. Compared with today’s PCs with built-in touchscreens the AirBar sensor keeps your high-quality matte display glare free and without greasy fingerprints. — said Remo Behdasht, Neonode’s SVP Business Development. AirBar uses the USB interface of your laptop to power itself and to transmit touch signals. As of now, it is available for Microsoft Windows and Google Chrome OS. Folks who are loyal to the Cupertino company, will have to wait for some time as the functionality is limited for their OS. At an introductory price of $49, AirBar is only available for the 15.6-inch laptops. The Sweden-based company plans to showcase their creation at the Consumer Electronics Show 2016 in Las Vegas. Before driving to your nearest cinema to catch the latest Star Wars movie, here’s something Master Yoda wants you to do. He wants you to open your Command Prompt/Terminal, enter few simple commands and watch the beginning of Star Wars saga in a manner you’ve never seen before. Go ahead! May the force be with you! Iknow you’ve watched all Star Wars movies a long time ago – multiple times, in multiple orders – on your television, computer, and in some cinema nearby you. But, with all the hype surrounding the just-released Star Wars: The Force Awakens, it makes perfect sense to re-watch the original series. But, why not try watching the beginning – Star Wars Episode IV – on your PC’s Command Prompt as an animated text? I won’t be calling it an Easter Egg as it has been around since the Windows XP days and you can do the same in later versions of Windows too (or any OS that supports telnet). How To Watch Star Wars In Command Prompt Via Telnet? The newer versions of Microsoft’s Windows OS don’t include Telnet. No worries, you can get it right now with just a simple and clean command on Command Prompt. Step 1: Just open Command Prompt on your PC, enter following command and press ↵ Enter. If you see a notification asking for Administrator permissions, enter the Administrator password and confirm to proceed. Step 2: Now restart the Command Prompt, enter the following command and press ↵ Enter. A security researcher has uncovered a serious flaw in Facebook-owned WhatsApp messaging app. This loophole exists in both the desktop and mobile apps. He found that by sending about 4,000 smileys to a target, the WhatApp app starts to slow down and ultimately crashes. In his discovery, we found that by sending about 4,000 smileys to a target, the WhatApp app starts to slow down and crashes due to “buffer overflow”. This flaw targets both the desktop and mobile apps. In the WhatsApp Web app, you are allowed to send a message with about 6,500-6,600 characters. But, after typing about 4,000-4,200 smileys, the browser/app starts to slow down. As you type more and more smiley faces, WhatsApp crashes when you type and send. Have something to add to this WhatsApp bug story? Tell us in the comments below. LG has shown off its new bendable, paper-thin TV panels, and it’s got us looking forward to a future with no cords, TV cabinets, and rickety stands. The South Korean company revealed a new 18-inch panel at a press show last week, plus two smaller iterations - one version that’s entirely transparent, and another that can be rolled up like a newspaper to a radius of just 3 centimetres. So what’s the catch, I hear you ask? It could be the potential price tag - CNET reports that LG's 65-inch, 4k OLED TV costs about $9,000, and that’s without the paper-thin novelty - but that’s not even the least encouraging thing about it.According to AJC.com, it could be another five to 10 years before these wallpaper displays are made available, because LG still hasn’t quite figured out how to manufacture them properly. "LG said it has hit an 80 percent yield, meaning that 20 percent of manufactured televisions don't work," says AJC.com. But don’t let go of your impossibly thin television dreams just yet. 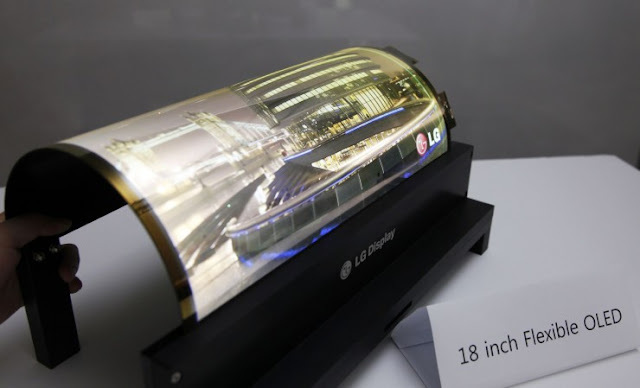 With the likes of Samsung, Nokia and Apple also well on their way to developing super-thin and flexible smartphone and tablet screens, good old-fashioned competition will likely steamroll this thing into our homes sooner rather than later. LG Display continues to be the leading pioneer in flexible technology - debuting its new flexible TV panel at an event in Korea this week. 18 inches wide, the screen offers high definition viewing – but can be rolled up into a 3 cm radius without damage to the screen or technology. The screen was made possible by its OLED, or organic light emitting diode, technology, which allows it to be lighter, thinner and more flexible than standard LCD screens. At an event in Korea earlier this week, LG demonstrated its newest flexible display screens, which are 55 inches wide and paper-thin at 0.97 mm thick, and weigh just 1.9 kg – all the while still offering high definition. Attachable to surfaces via magnets, the new screen can be fitted to curved walls. The benefits of this technology are that eventually, bendable TVs, tablets and smartphones will be much easier to transport and a lot less likely to sustain damage. Other companies such as Apple and Samsung have also been developing the technology – but although Apple offered up its most malleable iPhone yet in the form of the 6th generation smartphone, and Samsung previously promised flexible smartphones in 2015, neither have released any devices with the new fully-flexible technology. apple Inc. was founded on April 1, 1976, in Cupertino, CA by Steve Jobs,Steve Wozniak and Ronald Wayne in the car garage at Jobs’ house. Apple launched many revolutionary products like the iPod, iPhone, Macintosh and iPad. Company’s biggest achievement may be estimated by the fact that some people call every portable mp3 player an iPod, and they don’t know that iPod is a proprietary product of Apple Inc.
Ronald Wayne also co-founded the company, but he stepped out only after 12 days Apple came into existence. At that time, he sold his 10% share for $800. You’ll be surprised to know if he had retained those shares, their current worth would be $60 billion. But the 81-year-old Wayne has no regrets on that note. Apple users proudly show-off their iPad’s retina display and admire Apple for their awesome products, but most of them don’t have any idea that those retina displays are manufactured by Samsung for the iPads. It is hard to gulp the fact considering the Apple-Samsung legal fights being the talk-of-the-town since the past few years, and Samsung has been ordered to pay $548 million for copying iPhone designs. It is for the smokers, there is a weird clause by Apple. If you smoke near an Apple Computer, your device’s warranty will become void, so use the smoking zone or pay the repair charges next time your Mac breaks down. Siri has been praised for its intelligence, but she has a long lasting memory too. Apple analyses and stores every voice command you give to Siri. So, all your embarrassing requests to Siri are safely resting in the Apple servers, you know what I’m talking about. Apple is one of most valuable companies in the world, but they also have more cash than the US Treasury. With a $233 billion on its balance sheet, Apple can buy Disney, Coca-Cola, Uber and more. If you’ve seriously watched the Apple iPhone commercials, the time displayed is 9:41 AM. Have you ever thought why? This was the time when Steve Jobs unveiled the first iPhone in 2007. Apple fans have surpassed the limits when it comes to showing customer loyalty. One man waited in the line for 6 months to just buy the first iPhone 6 unit. A teenager in China sold his kidney because he didn’t have enough cash to buy an iPad. The man who is behind the creation of iPod, Tony Fadell, first went with his idea to Phillips and Real Networks, but they didn’t realize the true prospectives of his idea. And now we have Apple’s iPod. One more interesting addition to the facts list is a weird clause in the iTunes Terms and Conditions EULA. You can’t use it to make nuclear weapons and missiles. iPhones come at a pocket burning price, but that’s not the case when you need to buy electricity for them. Although Apple has launched the Smart Battery Case for iPhone 6S, if you give one full charge to your iPhone on a daily basis, at the end of one year it’ll cost you only $0.25. Quite manageable, isn’t it? If you apply for a job at an Apple store and a graduate course at Harvard, there better chances that you get selected in Harvard. When the first iPod prototype was presented to Steve Jobs, he dropped it in an aquarium to show that it could be shrunk further, considering there were air bubbles signifying the existence of empty space inside. MacBook’s battery loves you so much that it can take a bullet for you as they are designed so tough. Next time someone points a gun, just keep your MacBook in front of you. App Store for iOS has around 1.4 million apps with 100 billion download counts, but 60% of them have never been downloaded. Siri is an original product by Siri Inc. and they made it for Android and Blackberry, but Apple bought Siri Inc. in April 2010. And now we have a cute, intelligent and naughty voice assistant for our iPhones. When the number of employees started increasing at Apple, a numerical designation based on alphabetical order of the employee name was adopted. But Jobs didn’t like that he was #2 just behind Wozniak #1, thanks to the alphabets. So, he decided to take #0 retaining his belief to be the first every time. Jobs and Woz sold the Apple 1 for $100, but they never knew, one of their $100 devices would be auctioned for $905,000 in the year 2014. Apple started the development of a highly secretive project code-named as “M68” in 2004. The secrecy of the project was so important, that the software team had no idea what the hardware would look like and hardware team had no clue what kind of software might run on the device. It was known to a very few people, what the device would be as a complete product. And then Steve Jobs finally unveiled it as iPhone on January 9, 2007. Around 2,700 units of the Lisa computer launched by Apple in 1983 are buried in a Utah landfill, all because the product was a big failure. When Steve Jobs was asked to move out from Apple in 1985, he sold all his Apple shares. He then founded NeXT Computers and a year later he acquired the graphic division of LucasFilm which turned out to be Pixar, later acquired by Disney. Apple’s Mac OS X operating system is a modified version of NeXTSTEP OS which Apple inherited when they bought NeXT in 1996 after paying $429 million cash and $1.5 billion Apple shares. You didn’t realize, this is the 21st fact.